Barbour and Wright show them how institutions and rules determine who wins and who loses in the political arena. The authors carefully craft each graphic, boxed feature, and vignette to develop students’ analytic capabilities. 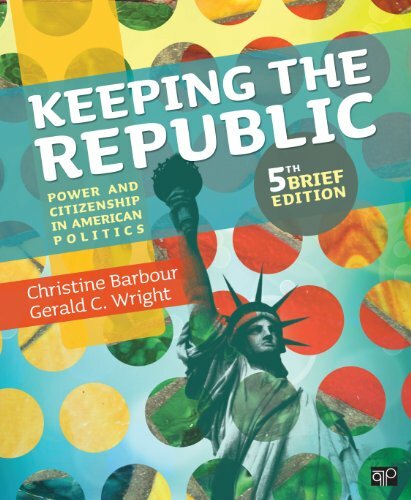 By introducing them to the seminal work in the field and showing them how to employ the themes of power and citizenship, this proven text builds confidence in students who want to take an active part in their communities and government-so they play their part in keeping the republic. at Indiana, but the two that mean the most to her were awarded by her students: the Indiana University Student Alumni Association Award for Outstanding Faculty (1995-6) and the Indiana University Chapter of the Society of Professional Journalists Brown Derby Award (1997). She is currently working on a book about local politics, development and the fishing industry in Apalachicola, Florida. legislatures. He has been a consultant for Project Vote Smart in the last several elections. Professor Wright is a member of the Freshmen Learning Project at Indiana University, a university-wide effort to improve the first year undergraduate experience by focusing on how today's college students learn and how teachers can adapt their pedagogical methods to best teach them. What's at Stake &#8230; in Taking It to the Streets? What's at Stake &#8230; in Challenging the Legitimacy of the Government? What's at Stake &#8230; When States Try to Prevent Undocumented Immigrants From Entering the United States? What's at Stake &#8230; in Requiring Employers to Provide Health Care Coverage for Contraception? What's at Stake &#8230; in the Adoption of Marriage Equality? What's at Stake &#8230; When the Use of the Filibuster Becomes Routine? What's at Stake &#8230; in Expanding Executive Power Through Signing Statements? What's at Stake &#8230; in Federal Regulation of the Organic Food Industry? What's at Stake &#8230; When the Supreme Court Gets Involved in Partisan Politics? What's at Stake &#8230; When We Move to More Direct Democracy? What's at Stake &#8230; in Working With Interest Groups Early in the Policymaking Process? What's at Stake &#8230; in How a Campaign Gets Out Its Vote? Who Are We? How did we vote in the 2012 election? What's at Stake &#8230; in the Demise of the Print News Media? Who Owns the Media, and How Does That Affect Our News? What's at Stake &#8230; in Moving to Renewable Energy?